In Today's Croydon Advertiser (65p for the working class, Free for the middle class) there is an article titled "Foreign folk are not first in the queue" this is a propaganda piece by David Churchill and Annabel Howard. What they wait until the last paragraph to say, is that what they consider to be a foreigner, is someone who does not hold a UK passport and is therefore not a UK citizen. 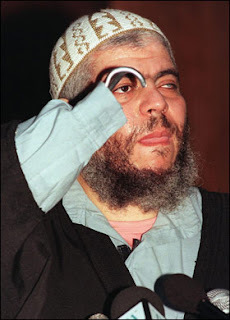 Among people who are considered to be 'British' are Abu Hamza(pictured) who was given a British passport and allowed to keep it after he divorced his wife and married another foreign national, and a number of bogus asylum seekers. In the politically motivated release by the Croydon Advertiser they claim to have polled 100 people living on Croydon's council estates, who on average, believe 49% of available stock, went to non-british residents, where as the Advertiser believes this figure to be, between 7 and 10%. rather than being a case of either the residents or the Advertiser being completely out with their estimates, it is more likely the case that they have different views, as to what 'British' is. Please feel free to comment on this post unlike the Croydon Advertiser which bans people or having conflicting opinions.